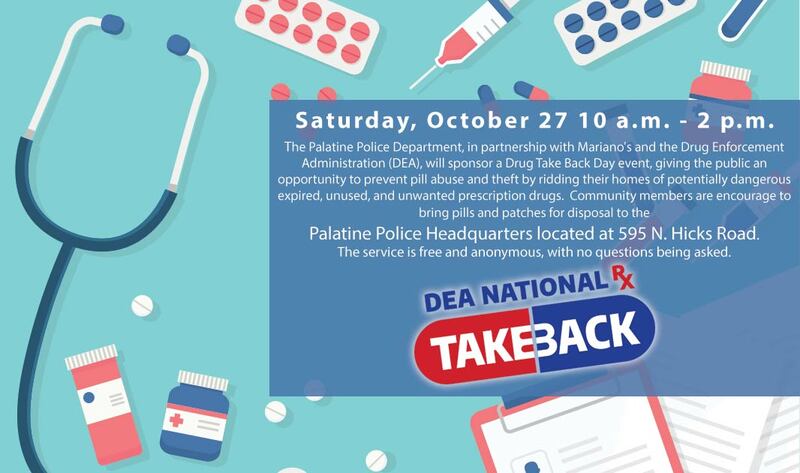 On Saturday, October 27 from 10:00 a.m. to 2:00 p.m., the Palatine Police Department, in partnership with Mariano’s and the Drug Enforcement Administration (DEA), will sponsor a Drug Take Back Day event, giving the public an opportunity to prevent pill abuse and theft by ridding their homes of potentially dangerous expired, unused, and unwanted prescription drugs. Community members are encourage to bring pills and patches for disposal to the Palatine Police Headquarters located at 595 N. Hicks Road in Palatine. The service is free and anonymous, with no questions being asked. Last spring, Americans turned in nearly 475 tons (949,046 pounds) of prescription drugs at more than 5,800 sites operated by the DEA and almost 4,700 of its state and local law enforcement partners. Overall, in its 15 previous Take Back events, the DEA and its partners have taken in almost 10 million pounds — nearly 5,000 tons — of pills. Syringes: Although the DEA does not accept syringes, Palatine Police will accept syringes for disposal. Syringes must be capped and packaged separately from medication. Liquids: Will not be accepted. This initiative addresses a vital public safety and public health issue. Medicines that linger in home cabinets are highly susceptible to diversion, misuse, and abuse. Rates of prescription drug abuse in the U.S. are alarmingly high, as are the number of accidental poisonings and overdoses due to these drugs. The Substance Abuse and Mental Health Services Administration’s National Survey on Drug Use and Health shows year after year that the majority of misused and abused prescription drugs are obtained from family and friends, including someone else’s medication being stolen from the home medicine cabinet. In addition, Americans are now advised that their usual methods for disposing of unused medicines — flushing them down the toilet or throwing them in the trash — both pose potential safety and health hazards. For more information about the disposal of prescription drugs or about the October 27 Take Back Day event, go to www.DEATakeBack.com or call the Palatine Police Department at 847-359-9000.